Jacket: wearing a blazer or a jacket seems a little formal when you want to wear the combination of smart-casual. Although, you can still wear a blazer/jacket and still have a hint of casualness in your attire. The neutral colors & its slim fit makes it a versatile piece to have in your wardrobe. Not only can they be worn in a casual way but also to the office with a formal look. Shirt: The next piece of style would be picking a shirt. The casual shirt is something that can be difficult and confusing sometimes as many men prefer shirts that are either formal or too casual. However, picking a formal shirt would be a better option because you can dress them easier. The crisp white color shirt makes it a perfect option for teaming with your casual outfit. It is worth investing. Trousers: Majority of people think that you would probably need to wear a pair of chinos or casual trousers for a smart casual look but you are wrong in this aspect because a pair of denim jeans would be perfect for both classy and stylish look, reason being they are easy o dress up & down to suit the occasion. You can prefer for a dark pair and slim fit denim jeans for this season. Avoid rolling your denim if you want to give yourself a smart casual look and prefer tucking your shirt into your jeans because this heightens your look whilst keeping it casual at the same time. Shoes: this is favorite part of dressing – the shoes! But they can be tricky sometimes because many don't know the actual difference between a casual pair of shoes and formal shoes. You can wear a pair of brown casual leather shoe for a classy look. This comfort pair from Altolia is best if you team it up with your semi-formal attire and if you are short in height then they are just meant for your feet as they are designed with concealed heels. Style them with your jeans and don't roll them up from the bottom. If you are anyhow looking for best height increasing shoes in India then don't forget to check our collection here. Accessories: you obviously can torch up your look by adding accessories when you are wearing a casual look but make sure that you don't throw off your entire look. If you are belt lover then the trick to pick the perfect belt is to match your belt color with your shoes. You can also add on some details like a good fragrance won't mind, isn't it? So make sure you choose a mild fragrance when you are styling a smart casual look. 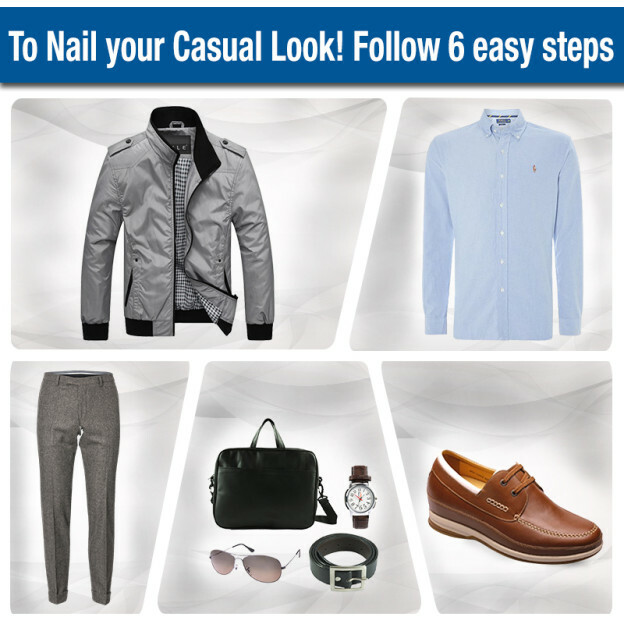 Lastly: I hope this guide will help you in styling your casual look without any hitch. Now, you can achieve this look perfectly. Good Luck with that!